Anyone who has lost significant weight will tell you that having food routines is a necessity. Eating the same or similar foods at the same time each day makes life easier. Here's a typical breakfast for me. 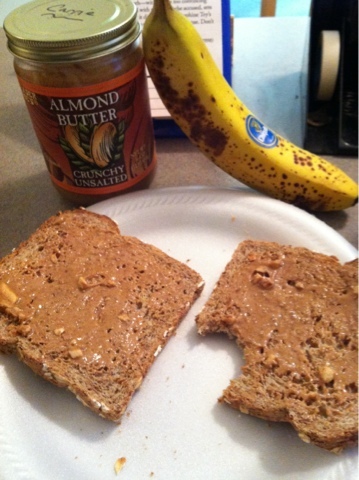 Ezekiel sprouted grain bread, a tablespoon of Trader Joes almond butter and a banana. Most days I have some type of complex carb with almond or peanut butter and a banana. On the weekend I'll mix it up, but this combo works well for me. I can't imagine having to cook for 2 kids on top of what I'm already doing for me! Having routines definitely makes it easier. I'm glad you're reading and hope we can get together again soon (maybe for a workout? ).